Gareth L. Powell was born in Bristol, England. 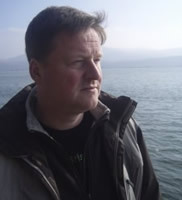 He is the author of the recent SF novel Silversands, and the critically acclaimed short story collection, The Last Reef. His work has been published in magazines all over the world and featured in a number of recent anthologies, including Shine (Solaris, 2010). In 2007, his short story ‘Ack-Ack Macaque’ won the Interzone Readers’ Poll for best short story of the year. Gareth lives in the English West Country with his wife and two daughters, and can be found online at www.garethlpowell.com. CLICK HERE FOR MORE BY GARETH L. POWELL. “Let me get this straight. You’re a World War II fighter pilot,” I say to Ack-Ack, the one-eyed, cigar-chomping macaque as he leads me through the corridor of the airship. “What’s your question?” He glares, a daiquiri glass clenched in his left paw. 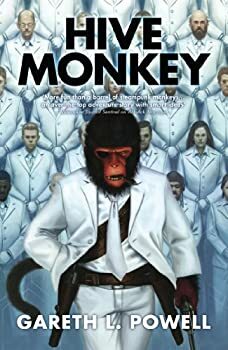 Hive Monkey is the second book in Gareth L. Powell’s ACK ACK MACAQUE series, originally dubbed a trilogy but now, apparently, fated to be a quartet. 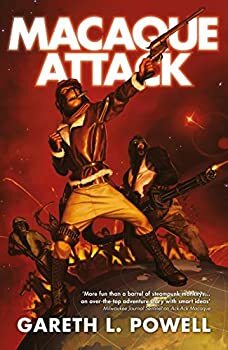 The eponymous monkey, who likes cigars, rum and flying a refurbished WWII Spitfire, plays a large role in this book, gleefully wreaking mayhem on the bad guys. His sidekicks, Victoria Valois, journalist-turned-airship-captain, K8, plucky girl hacker, and Paul, a hologram, also have roles to play as they battle the colonized drones of an evil hive-mind. For the first two books in Gareth L. Powell’s MACAQUE series, I felt like I was standing in the center of a seesaw or teeter-totter, trying to hold the plank level and balanced. With the third book, Macaque Attack, the totter tipped and threw me off. I can no longer maintain the suspension of disbelief needed to enjoy these adventures. This review may contain spoilers of all three books, so be warned.